I was sitting in church last night, just after the time of worship ended, when the lights dimmed and our worship pastor stood on the stage for a few moments to share with us about Psalm 10. This is the psalm that begins, "How long, O Lord, will you stand afar off?" It is a psalm, he said, that had been on his mind for a few days, one reason of which was the upcoming release of a book of letters that reveals Mother Teresa's sustained season of feeling bereft of God. I sat up straight, of course, and nudged Kirk with my elbow. He nodded at me encouragingly, knowing my ongoing and continually growing interest in this woman. 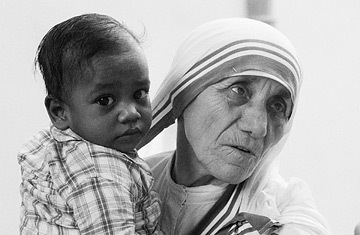 Vernon (our worship pastor) went on to say that this season of darkness lasted over four decades of Mother Teresa's life. Whoa. And he also made reference to the book's title, Come Be My Light, which sent me on a hunt again this morning for more information. After my indignation at the CBS article last week, which cooled a bit after reading the CNN article shortly afterward, this TIME article did much to repair my faith in solid news practices. It is a thorough rendering of a complex subject (at least, as thorough a rendering as a magazine article can give), and I appreciate the efforts taken to secure a greater degree of historic understanding of the movements of personal faith. For those interested, Come Be My Light releases on September 4. I know that I, for one, will pick it up . . . and you can expect to hear more on the subject here, as I go.